The RIAS is an incorporation of its six Chapters around Scotland. Each Chapter has its own elected President. The Stirling Society of Architects is one of the six chapters. The RIAS is the country’s most important resource for architectural material. 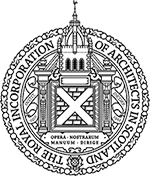 There is a specialist bookshop, a library for members and students, and an extensive architectural books and drawings collection, much of which is kept with the Royal Commission on the Ancient and Historic Monuments of Scotland (RCAHMS) in Edinburgh. The bookshop is located at 15 Rutland Square, Edinburgh. It caries a wide range of architectural publications ranging from books on accessibility to world architecture. It also carries contract documents as well as their associated forms for use by Architects and the general public. The bookshop also has an online presence. Although small, the RIAS Library is of exceptional significance to the profession’s history. Computerised cataloguing of the Library is ongoing. The Library is available to members and students by prior appointment. Contact: Carol-Ann Hildersley 0131 229 7545 or childersley@rias.org.uk. The RIAS Drawings Collection consists of approximately 9000 drawings, with a considerable number of historical photographs, some sketchbooks and framed material. The earliest drawings in the Collection are by James Adam. There is a fine series of drawings by William Playfair, mostly from when he was a student. There are examples by David Bryce, Alexander Thomson, and a significant collection of turn-of-the-century drawings by Robert Lorimer (part of the Scott Morton Collection), James Jerdan and James Miller. The James Miller Archive is the largest single archive in the Collection, comprising some 4000 drawings ranging from 1880 to 1945. The RIAS Collection is housed in the premises of the Royal Commission on the Ancient and Historical Monuments of Scotland, John Sinclair House, 16 Bernard Terrace, Edinburgh and is managed by the Curator of the National Monuments Record. It is open to the public at normal Commission times – which are available by telephoning 0131 662 1456 – preferably by prior appointment. The RIAS works closely with The Royal Institute of British Architects (RIBA) and members living and/or working in Scotland are encouraged to take up joint membership – allowing them to enjoy the benefits of membership of both organisations at no extra cost. Both organisations speak with a united voice on behalf of architects and architecture within Scotland and, where appropriate, the UK and overseas. The RIBA is located in London. You can search the collections online through the RIBA Library catalogue and browse more than 95,000 images on our image library. If you have a question, contact RIBA on +44 (0)20 7307 3882.